I started Cooking In Red Socks as an outlet for my love of food that would stay constant no matter how many times we moved on a given year. It has always been, and will be, a reflection of where we are and what we are going through in our lives. I took the most amazing class in college, Food Anthropology, that had one main theme: Food in the representation of culture. What we eat and how we eat it represent our social structure, government, and religious ideals. If Cooking in Red Socks is a representation of me and our lives, it is a crying shame that all of my dessert recipes have been chocolate. I don’t really like chocolate. Give me fruit, a heat source, and some frozen yogurt, and now we are talking. The words “crisp”, “crumble”, or “cobbler” awaken all of my culinary senses and have me looking for more. 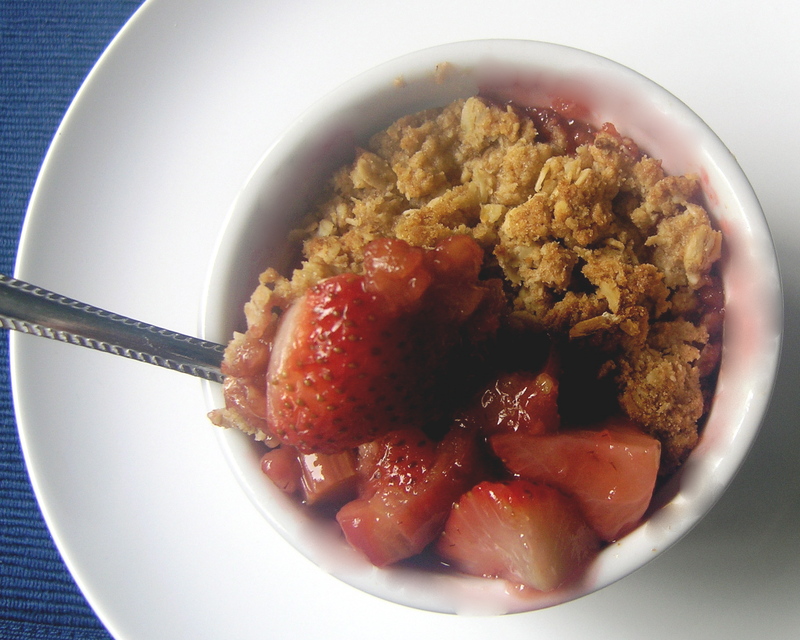 And now I introduce my favorite dessert on CIRS so far… Strawberry Rhubarb Crumble. Preheat the oven to 350 degrees and spray the ramekins with cooking spray. In a medium bowl, combine the diced rhubarb, strawberries, and sugar. Let the fruit macerate in the sugar for 5-7 minutes. Add the remaining ingredients and set aside. Combine the whole wheat flour, oats, and butter in a small bowl. Use your hands to combine the butter with the dry ingredients. Knead it together so that the mix starts to look like wet sand. Add the apple juice and combine thoroughly. Divide the fruit among the four ramekins- you should have 1 cup of filling for each. Divide the topping and cover the tops as best you can. It will not cover it all, so I like to have little glops of it all around. Place the ramekins on a cookie sheet and bake for 20-25 minutes, or until you see the liquid in the bottom start to bubble. Remove from the oven and carefully place each ramekin on a serving plate. Remind your guests it’s piping hot!! Serve with a small scoop of vanilla frozen yogurt if you’d like. I grow a lot of rhubarb and I’m always looking for new ways to use it. This crumble sounds wonderful!